Digital Cowboy Webcam With 7x Zoom | OhGizmo! By Andrew Liszewski on 01/29/07 • Leave a comment! From Japan-based Digital Cowboy comes this pretty run-of-the-mill 1.3 megapixel webcam that really only stands out thanks to an attachable telephoto lens which gives it an impressive 7x zoom capability. 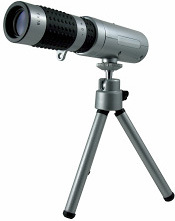 The DC-NCP130 is expected to go on sale in Japan next month for about $80 and will include both the telephoto lens as well as the detachable tripod.